The Western Avenue Bridge is a bridge carrying Western Avenue over the Charles River between Cambridge, Massachusetts and Allston, Boston. 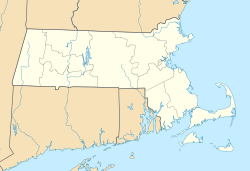 It was built in 1924 by the Commonwealth of Massachusetts Metropolitan District Commission. The bridge carries one-way traffic going west, into Allston. Eastbound traffic must take the nearby River Street Bridge. The original bridge on the site was the River Street Bridge (not to be confused with the modern River Street Bridge just down the river) constructed in 1824. ^ Marchione, William P. "What's in a name?". Brighton Allston Historical Society. Retrieved June 19, 2011.